Preston Brooks, a native of Ninety Six, lived on a plantation in Ninety Six in area that what was once Edgefield County, SC. Preston had commanded the “Ninety Six Guards” in the Palmetto Regiment during the Mexican War and came from a rich, powerful and influential family. 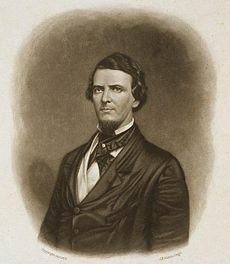 In 1850’s as sectional differences over slavery grew between North and South, Preston Brooks, a US Senator, became featured in a dispute tearing the country apart. In 1856, it was reported that Preston Brooks was deeply insulted and humiliated over US Senator Charles Sumners “Crimes Against Kansas” speech which made direct insults to Preston Brooks kinsman US Senator Andrew Butler and to all citizens of the State of South Carolina. Senator Sumner had been warned by several other Senators to withdrawal his speech, but he proceeded. Brooks then severely assaulted the abolitionist of Massachusetts with his walking cane on the Senate floor. US Senator Brooks was fined $300.00 and he resigned from the Senate House, due to stress over the incident . Shortly thereafter, a campaign to re-elect Brooks to office began. A crowd estimated at 10,000, the largest ever to have assembled in Ninety Six, was held in our small town on October 03, 1856 to honor and promote Brooks. Brooks had the support of the people in his district and from the southern states majority whom came from miles to listen to five hours of oratory; and to partake of a free barbecue dinner that evening. Special trains were run from Greenville and Columbia, SC to bring dignitaries and ordinary citizens. The New York Times sent a reporter and his account of the event covered the entire front page just a few days later on October 8th. The historical event was reported as “the largest gathering ever in the upcountry”. Brooks received wagon loads of canes to replace the one he had destroyed beating Sumner. US Senator Brooks was re-elected and returned to office, where he died a few months later from an unknown illness. Broken pieces of the original gold top cane can be seen today at the Old State House Museum in Boston, Mass and at the St. Augustine Ripley’s Believe it or Not Museum in St. Augustine, Florida.